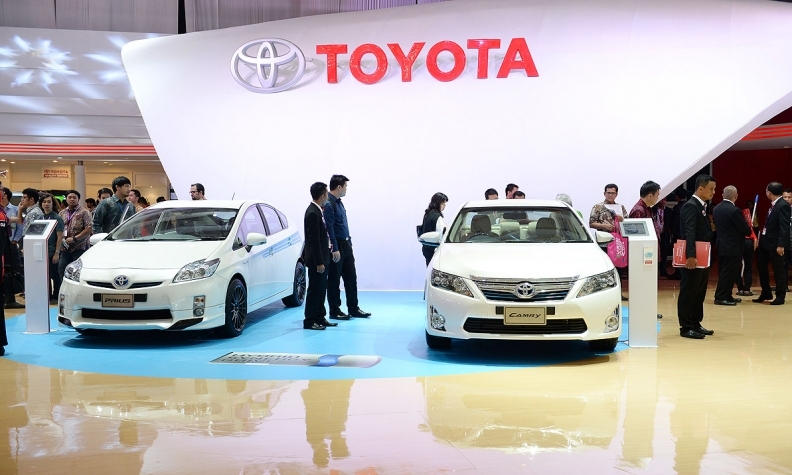 A Prius, left, and Camry on display at the PT Toyota Astra Motor booth at the Indonesia International Motor Show in Jakarta last month. Toyota was named the best automotive brand worldwide for the 11th straight year, followed closely by Mercedes-Benz and BMW, in Interbrand’s ranking of the 100 most valuable brands. Apple, Google and Coca-Cola remained the top three overall brands, but Toyota wasn’t far behind at No. 8, two places up from a year earlier. Toyota has been the most valuable automotive brand on the list since 2004. Interbrand, a unit of advertising giant Omnicom Group, included 13 automotive brands on its list, a number unchanged from a year earlier. New to this year’s list is Land Rover, at No. 91, while Ferrari, No. 98 last year, has fallen off. The 15th annual ranking was released today. Interbrand bases its rankings on brands’ financial performance, influence on customer choice, and price and earning strength. Three of Interbrand’s five top risers by percentage were automotive. Audi’s brand value increased 27 percent to $9.83 billion, while its ranking rose to No. 45 from No. 51. Interbrand credited Audi’s sales, high profits, electric models and partnership with Google. Volkswagen and Nissan were also among the top five risers. Volkswagen’s brand value rose 23 percent to $13.72 billion, and it rose three spots to No. 31. Nissan’s brand value also rose 23 percent, to $7.62 billion. The Japanese automaker surged nine spots to No. 56. Mercedes-Benz this year moved up to No. 10 after two years in 11th place. BMW ranked just behind at No.11, up one place from 2013. Honda held its No. 20 ranking for the second straight year, and Ford rose three places to 39 from 42. After a 10-place rise from 2012 to 2013, Hyundai climbed three more spots this year to No. 40. Porsche rose four places to No. 60 on the 2014 list, after an eight-place leap from 2012 to 2013. Kia surged nine spots to No. 74, and Chevrolet finished the automotive brands listed at No. 82, a seven-place improvement from a year earlier. Technology companies dominated the overall top 10: Apple (No. 1), Google (No. 2), Microsoft (No. 5) and Samsung (No. 7). In addition to Toyota and Mercedes-Benz, Coca-Cola (No. 3), IBM (No. 4), GE (No. 6), McDonald’s (No. 9) rounded out the top 10.